26" x 21.5" x 1"
Vessels. 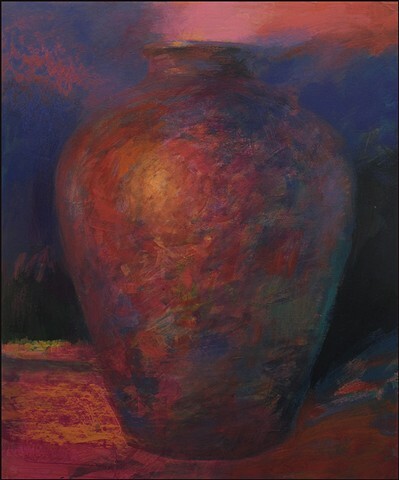 There are other common names for these forms I've been painting: pots (with a wink and nod), vases, urns, jars, etc. I use the term "vessel" deliberately because it seems closest to how I think of them. The term conjures up many metaphors: a reference to travel or movement; journeys of some sort, whether physical or in our imaginations. I like to think of them as stand-ins for human beings as receptacles of creativity, spirit and transformation. On Canson Montival 140 lb. paper, mounted on cradled board and varnished--no glass required. Wired and ready for framing, or hang as is. Free shipping in U.S.